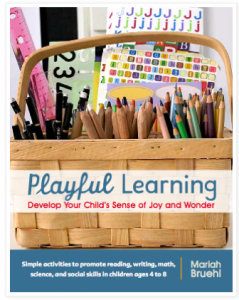 I’m thrilled to be a stop on Mariah Bruehl’s blog tour for her must-read book Playful Learning: Develop Your Child’s Sense of Joy and Wonder , a useful resource for parents and teachers who want to infuse learning with playfulness. Yes please! They say that you can’t judge a book by its cover, but this book is certainly an exception. The cover is gorgeous, and the content is equally rich. Mariah has worked in the field of education for over a decade, runs one of my favorite blogs, Playful Learning, and owns a brick and mortar shop in Sag Harbor, NY where children can take workshops and grown-up can buy super-useful supplies. Mariah also teaches E-courses, and I’m giving a spot away to one lucky reader at the end of this post. 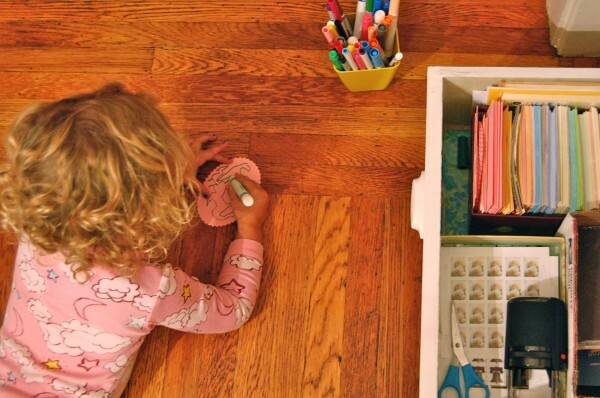 Playful Learning is full of meaningful — and doable! — activities for children ages 4-8. Although my own children are 1 and 3, it feels like the perfect time to add this book to my library… some of the projects already relate to my three year old’s abilities and interests, and the rest is food for thought as I plan for what’s to come. As soon as I read about the Mail Center in a section of the book called Playful Learning Spaces, I knew immediately that it would appeal to my three year old. The morning that the book arrived, N was busy putting together a care package for her uncle who recently moved to a new town. 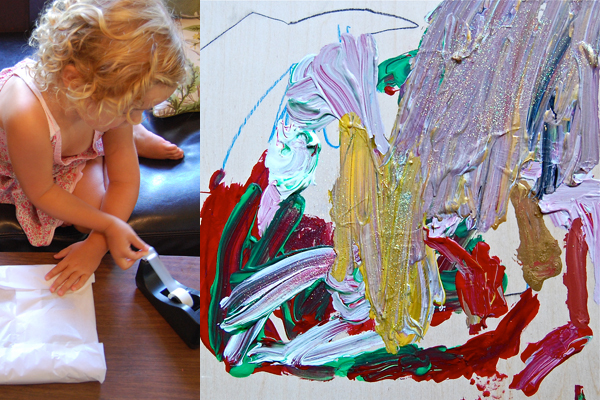 After wrapping up a painting and some home-baked cookies, we waited patiently in line to ship it at the post office. N helped me address the label and wanted to choose our new sheets of stamps. We were ready for a Mail Center! I took inspiration from Mariah’s suggestions and assembled a center that would work in our space. I moved everything out of a bottom drawer in our dining area (it used to hold our table linens) and filled it with envelopes, cards, stamps, scissors, mailing labels, and our return address stamper. I also put our incoming mail in the far right side of the drawer. It’s all self-service — N can go right to it, take what she needs, and then close it up when she’s done. She’s learning how to properly stamp an envelope and where to attach labels and return addresses. I loved Mariah’s suggestion to create an address chest so that children can label envelopes on their own. Ownership builds confidence! 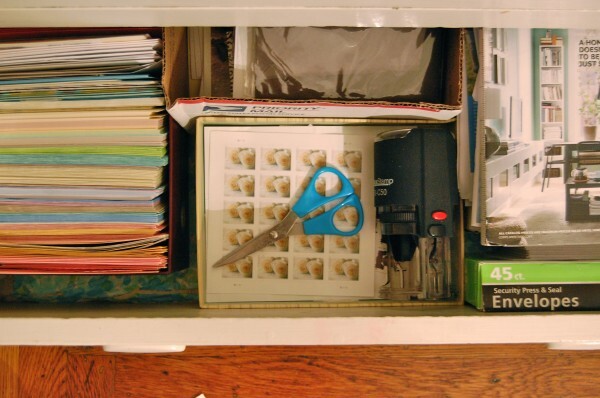 Photos of loved ones go on the outside of the drawers and their address labels go on the inside. Since I didn’t have a chest, we improvised by taping photos of loved ones on the outside of envelopes. 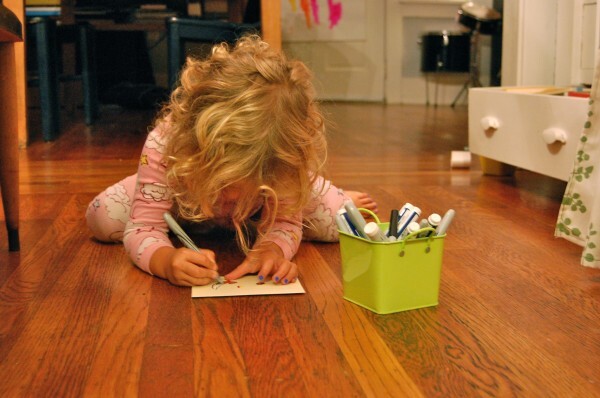 And now my daughter can stamp, address, and mail her own creations…all by herself. If you would like your own copy of Playful Learning you can buy it on Amazon or purchase a signed copy from Mariah’s shop. I’m happy to share that Mariah is giving away both a copy of her book AND a spot in her 6-week E-Course, Playful Learning Spaces. For a chance to win a copy of Playful Learning: Develop your Child’s Sense of Joy and Wonder or a spot in Playful Learning Spaces E-Course ($125 value), leave a comment here by Friday, September 9 at 9 pm PST. Please specify if you prefer one prize or the other. Winner will be chosen randomly and announced on my blog on Saturday, September 10. This project is shared with It’s Playtime.